So what has piqued my interest again? Well it’s the next generation Citizen F100 Satellite Wave GPS CC2006-53E, which is so Attesa like I’m surprised they didn’t just call it the Attesa Wave, but they didn’t, instead calling it after their Wave 100 technology the F100 Satellite. But I can’t complain as this is one of those models that comes up every so often that hits the spot. 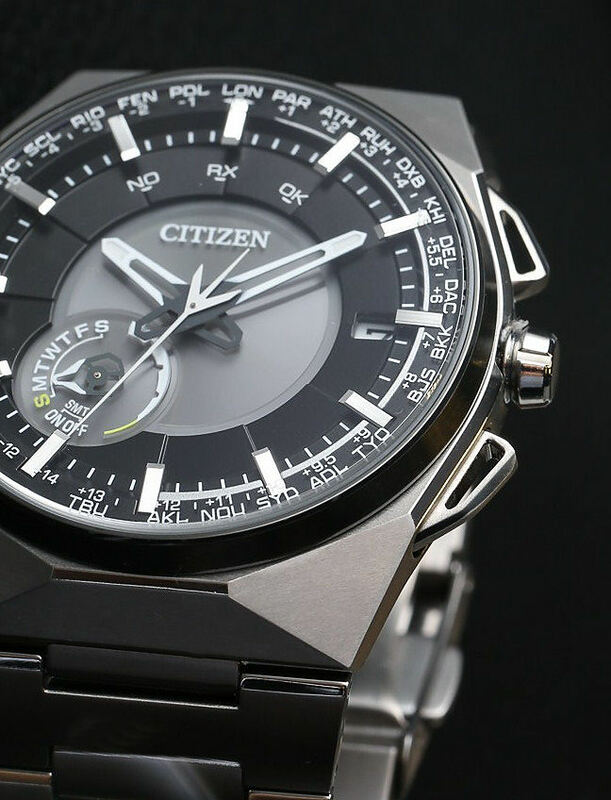 Citizen have managed to squeeze into one of the sleekest DLC (diamond like Carbon) faceted Titanium cases I’ve seen, all the updated components to make the world’s thinnest light-powered satellite synchronized watch there is. It also receives satellite signals faster than any other model (3 seconds!) and keeps +/- 5 seconds per month accuracy anywhere on Earth. The crystal is anti-reflective Sapphire and the case has a Water Resistance of 100m. 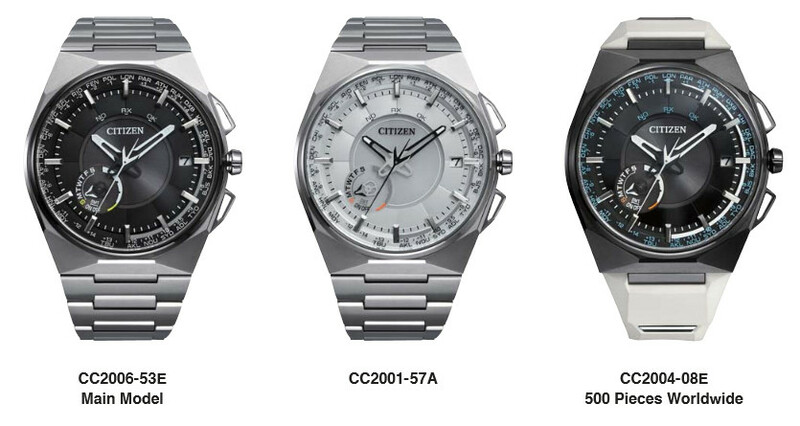 Citizen’s Eco-Drive (solar) means no battery issues ever and the Wave technology gives accuracy with it’s World wide Satellite Timekeeping System, covering a whopping 40 Time Zones. The Seconds hand doubles as the indicating pointer for various functions (Month, Time Zone, Signal reception etc). A Perpetual Calendar to 2100 and luminous hands and markers, a Light Level Indicator and a Power Reserve Indicator more or less rounds up the features. The bracelet is Duratec coated Titanium and fits to small spring bars, so unfortunately is bespoke, but it IS an excellent and tapered Titanium one and if anything like my old Attesa, then I’m happy with that. But what I really like about this model is that they’ve managed to incorporate this technology behind a simple, clear and very easy to read dial and in my opinion superior to all competition – and as you well know by now this is a particular bugbear of mine. Date is in a conventional Date aperture @3 and the sub dial @8 shows the Day, Power Reserve and Daylight Saving Time. Previous incarnations of this technology tended to be oversize with dial clutter the likes of which even your Optometrist could not fix, no matter how many pairs of glasses he recommended! Note that the watch is remarkably light weighing just 108 g and assisted by the hollowed out skeletal pushers. It is also a slim case at just 12.4mm thick and 45.4mm wide (I’d swear this was my old Attesa) and it’s a delight to wear and looks great on the wrist. It basically comes in 3 variations, two for mainstream sales and one Limited Edition, but my preference is as shown here – the 53E. So another gift idea for Christmas? or something that you might just drool after yourself – I know I could . . . . maybe this model is truly the “ultimate”. Basically because you put it on and that’s it! No battery changing, no time or date adjustments, no location time alterations, swim in it, slip a shirt over it and easily read it in the dark. The price of the F100 Satellite Wave is just over £1000. There is of course competition in the GPS stakes, basically from Seiko, but the Citizen is generally smaller, sleeker and as far as the dial is concerned and regardless of Seiko version (they have a few) the Citizen is less cluttered in my opinion in use. It should also be noted that the Citizen shown here does not automatically receive satellite signals, rather it is manually carried out. And that’s fine by me as unless the watch is in a sky view position, such reception won’t happen anyway. The Seiko model I compared it to, does receive automatically, though if unsuccessful for any reason, it will not attempt receive again automatically until the next day, so a manual receive would probably have to be done anyway. A collector might regard this as a milestone model, where Citizen and indeed Seiko have refined the technology such to now produce fine GPS examples and that’s good. But as a practical Time Zone watch, unless you really do travel all over the world and very often, it begs the question – and also as the only advantage over current Word Timer models is that you don’t have to know the time wherever you are – the watch will find that our during reception – so do they really represent value for money? For example I already have the Citizen A-T CB0020-09E with a neat World Time Zone feature (26 zones) which is incredibly easy to set (crown out, turn to city, crown in – job done), it also has Eco-Drive and it’s Radio Controlled. So it’s a super simple to operate, wear and forget model, great world traveler and it cost me about a 1/4th of the F100 Satellite Wave. But this video is absolutely the best! – as it makes everything very clear and better than any instruction booklet! In fact it shows that Citizen have actually done a fine job in making the operation of the F100 about as simple as you could hope for. And if I ever decided to buy this watch – I’d stick this video on my iPhone! Oh yes!